Michael Friesen, a full-time journalism student at the University of Western Ontario, is a MIDI fanatic who likes to annoy retailers by asking them about products that haven't yet been released. 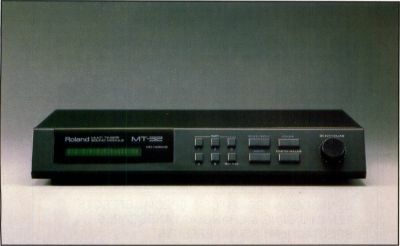 Roland's MT-32 is a great little synthesizer. It's got warm sounds, a full complement of PCM sampled drums, and a great multitimbral, multichannel MIDI implementation. Roland's MT-32 is a great little synthesizer. It's got warm sounds, a full complement of PCM sampled drums, and a great multitimbral, multichannel MIDI implementation. The only problem is that it's essentially a preset machine. You can't edit any sounds from the front panel. That means that it's impossible to modify the SynBrassl sound so that it doesn't distort when it hits the unit's D-A convertor. That means that you can't tweak Str Sect3 to rest cleanly in the groove instead of screaming every time you push the velocity. That means that, unless you're content with the presets, you need a patch editor/librarian. 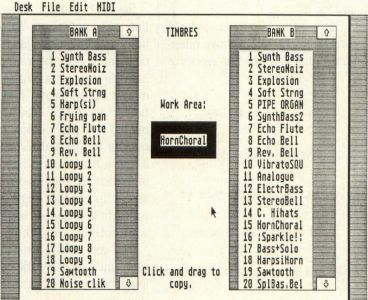 These programs perform two basic functions: They allow you to modify the sounds on your synth by using the input/output facilities of a computer, and they allow you to store and retrieve sounds to and from an archival medium. 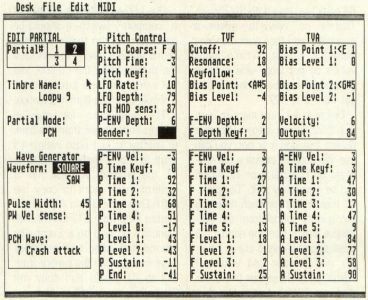 Joel Koftinoff of British Columbia, Canada, has written a patch editor and librarian for the MT-32. The literature (I use that word guardedly) says that it was a joint project with Roland Canada. That means that Roland (Canadian division only) is handling the distribution of the program. The Canadian price is between 105 and 130 Canadian dollars. The most important program is the one that lets you edit and store your sounds. Appropriately dubbed MT__EDIT, this exists both as a stand-alone program and as a desk accessory. The latter file is a blessing for those who don't have multi-program systems. For example, it means that I can write this review while having the editor resident in RAM any time I want to check on a feature. In more normal applications, this feature would allow you to use the editor from the desk of your GEM-based sequencer. The only caveat here is that the editor will eat up almost 80K. Those running high-end sequencers on a 520ST may find themselves quickly running out of RAM—or unable to run it at all. Just to make matters more confusing, Dr. T's Keyboard Controlled Sequencer doesn't allow for GEM-based applications anyway, and Hybrid Arts’ MIDI-Track and SMPTE-Track don't allocate enough accessory space to run the editor in the desktop anyway. For those with Hybrid Arts sequencers, there is still a way to use custom patches. Koftinoff has thoughtfully included two smaller desk accessories. One of them will allow you to modify the System Area (reverb, volume, pan) as well as load banks from disk and send them to the MT-32. The other is the sender-only, and can be placed into an AUTO folder. It will then send a bank to your MT-32 whenever the ST is booted from that disk. The sender and system controller have both been released into the public domain and may be freely traded. That means that someone with an editor can trade his sounds with someone who doesn't have the editor. Hooray! It's a good move that partly mitigates the copy protection on the other programs. There are two banks of new sounds, two banks filled with editable versions of the ROM sounds, and a bank devoted to percussion instruments. 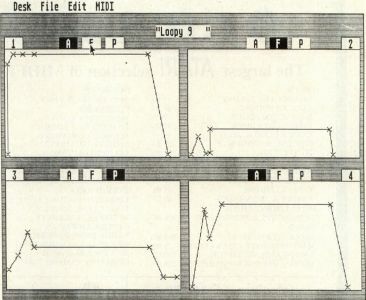 There's one more neat program called THRU.TOS, which provides a readout of incoming MIDI events. A register shows the last program change message received on each channel. The note matrix itself can accommodate up to eight events on each of the 16 channels. While useful for debugging your MIDI system, you won't want to perform through it: It only took a four note chord on three simultaneous channels to send the thing into serious delays. It also crashed me back to the desktop when I tried a three-channel glissando. Still, it could be useful. I'm glad to say Koftinoff gave me more than I asked for. Here we come to the nub of the matter. Is it a good editor? The answer is yes. And no. On the plus side we have a user interface that allows you to move in between hierarchal levels from one point directly to another—rather than having to step through a pyramid. The program also remembers where you were last time you were on a certain page. You can tweak the sustain rate on the envelope page, go the system page, then return to the same parameter on the envelope page just by hitting one key. Individual partials can be toggled on and off from any page by hitting Shift function key 1 through 4. Having mouse-draggable points on envelopes is a lot of fun. I often left this review to check on some feature, and then found myself spending an hour just playing with envelopes. One envelope window for each partial is displayed and each can be selected to show pitch, amplitude or filter envelopes. Envelope parameters can be fine-tuned on the partial parameter page. The layout is logical and neat. All edits are done with the mouse. There's no way to select a parameter and then punch a value from the keypad. What's more, values do not loop—and it takes what seems to be a long time to get from 0 to 127. 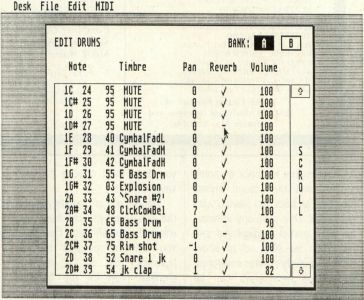 One feature I must mention is on the Edit Drums page. Whether Roland intended it or not, you can use this page to create a full keyboard on Channel 9 or 10, which can be completely split. "Completely" means that for each note you can specify sound (from the percussive files or from the normal 128 synth sounds), reverb status (on or off), pan, position and volume. I repeat, all of these can be set for each note! With power like this, you don't even need a multisplit keyboard! Changes are immediately sent to the MT-32, so you can hear what effect the modification has made. You'll have to retrigger the note, however; it's not a real-time process. Now for the flip side. There are some odd features and outright omissions. One of the oddities is the lack of a "compare" switch. It should be possible to return to the unedited sound without having to first save the timbre, bring the original into the work area, and listen to that. It should be a one-button operation. The procedure for copying timbres and patches from one bank to another is just plain weird. 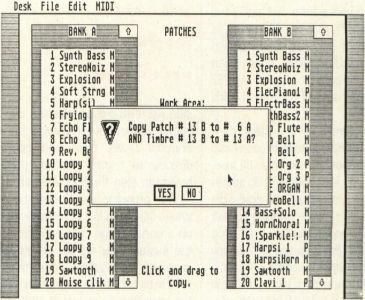 If I want to copy a patch from B13 to A1, the program will ask me to confirm that I want to copy the Patch Data from B13 to A1, and the Timbre Data from B13 to A13. The manual is no help here. Eventually I found that going to the Timbre page and copying the timbre from B13 to A1 would also copy the Patch Data from B13 to A1. Time for a slight digression: Two years ago, when I was working for a theatre company, I had to come up with a whole passel of new sounds for a DX7II. What I wound up doing was copying out the parameters onto data sheets. I'd isolate operator stacks, label them and then recombine stacks from various patches. I'd design voices on paper and then do the fine-tuning on the synth. Now consider the MT-32. Although Linear Arithmetic synthesis isn't quite as cryptic as FM, the MT voice can have up to 400 parameters (about 100 for each of four partials). Even with the partial mute on, it's hard to remember which partial is contributing what to the whole sound. It would have been a simple thing to include a patch-print feature. It would have made programming much easier. Jeff told me that an update to include patch printing is in the works, and may be done by the time this is published. One more complaint, and this one is directed at Roland: The omission of a battery backup for user memory is…well, stupid. I bring this up because it makes the program both terribly important, and at the same time strangely futile. You need to have the ability to edit sounds—that's a cornerstone of synthesis. Yet the task of booting up the sender every time you want to play custom sounds can lose its appeal in a hurry. Some users may decide the effort isn't worth it. Others may not. In spite of the omissions, and in spite of Roland's design problem, Koftinoff's editor has an honored place in my software library. It lets me mess around with my sounds. It lets me create the sounds that Roland should have built into the unit to begin with. It lets me customize the presets and make them my own. And as long as it does that, I'm willing to put up with the all the rest.